Yoda emanates a vast wisdom and power made all the more impresive by his humble deportment and diminutive size. A rarely seen species from an unknown homeworld, Yoda possesses capabilities that give him impressive strength and speed. While he is clearly the wise, elder statesman in the Jedi High Council, Yoda is also a superlative warrior who can overcome virtually any opponent. Well into his eighth century, he has learned to apply caution and reflection in discordant situations, but when war erupts, he does not hesitate to fight. He battles head-to-head with another powerful wielder of the Force, displaying great agility and masteful skills with his lightsaber. 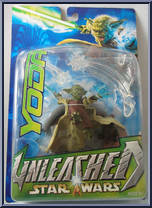 As the two foes clash, Yoda, empowered by the Force, leaps and twirls in the air, relentlessly battering his opponent. When he is forced to choose between saving the lives of his compatriots or executing the final blow in battle, Yoda chooses life over victory, allowing his enemy to escape. Yoda's powerful warrior skills as well as his wisdom will now be tested as the galaxy collapses into full-scale war. Contribute pictures, update details or suggest corrections for Yoda. Write a review about Yoda.